We’re in the thick of Christmas album season at the moment, and one of the best offerings for 2013 comes from Sydney band Garage Hymnal. The group haven’t released an album for a number of years, but Christmas LP Lowly hit our ears in November and is filled with many original songs packed with Christmas charm. I got to talk to singer Alanna Rodgers at length about Lowly, Christmas, and near-death experiences while recording the album. SAM: It’s been a few years since we’ve heard a full length album from Garage Hymnal, last year you released the Bird in a Winter Storm EP – what’s been happening in that time? ALANNA: Yeah we’ve had a couple of changes. We lost one of our members which is sad. I think we’ve been rebuilding from that and trying to fill in the gaps, without having a full-time keyboard player now. And we had been thinking about doing a Christmas album for some time so I think we finally felt like the time was right to do it. And here we are! SAM: Yeah! Lowly has just come out. Why did you decide to release a Christmas record? ALANNA: There’s always that joke of like a band gets to ten years old and they’re like ‘Oh! Let’s release a Christmas album! That’s all we’ve got left to do!’ No, that is not our reason at all. We obviously love Jesus, and Christmas is a very special time for people who love Jesus. And it’s a really special opportunity for us Christians to connect with our community. It’s something that people are willing to be involved in, and come into a church to hear about Jesus’ birth. And we wanted to write songs that were about the miracle it is that God sent his Son in the form of a baby, and the humility that God shows through that. We wanted to write something that was fresh. We didn’t really try to tackle any of the really big carols. Most of them are stuff that we’d written from scratch. SAM: I was thinking that! For a Christmas record you look at the tracklist and there’s not many classic carols as you might expect. Why did you guys decide to write your own Christmas songs? ALANNA: Yeah – I guess we didn’t want to add to the tens of thousands of arrangements of the classic carols unless they were going to be the best that had ever been. I think we thought we didn’t know if we could do that. We also went through a lot of old hymn books and found a bunch of Christmas hymns that had gotten lost. That are not the big ones we still do today, but had really brilliant words. And so a lot of the new melodies we’ve come up with are actually based on these lyrics that we found that are from a few hundred years ago… We wanted to bring them to life. SAM: I think you definitely do that. The first track on the album is almost completely acapella – Go Tell It on the Mountain. Why open the album with this track? ALANNA: I think it was an unexpected one for a Christmas album. I think people don’t think of that as a Christmas song, but maybe more as a kumbaya song. Campfire type thing. But it’s about Jesus’ birth and proclaiming Jesus’ birth. So I thought that would be a really lovely way of starting it with our intention, which is the proclamation of Jesus’ birth. And doing it the way we did captured a bit of the vibe we were going for which is a little bit more intimate that some of our other albums, or a little more reflective and communal, if you like. SAM: Why did you name the album Lowly? ALANNA: Lowly is an old word which I guess – the closest synonym is humble. And in naming our album, we did that last, after we’d already written and chosen the songs that we would put on it. And just going through the themes of our songs and what has come out in our final product. That was the theme that just kept jumping out at us. We decided to go with the word lowly in particular. It has a bit more of a Christmas ring to it, but also people think – it makes people ask the question: ‘What is Lowly?’ and ‘What does it have to do with Christmas?’ Hopefully that is answered in the songs, in showing the incredible gift that God gave, and the way that he gave it. SAM: I mentioned earlier that many of these songs are your own. What is the process like to write a Christmas song? Is there a difference between writing that and a normal modern hymn that you’d write on another Garage Hymnal record? ALANNA: I guess there is something about a sound that makes people think of Christmas. So, there is sleigh bells in there, and that kind of thing. But I think that that is just an icing on a hopefully good, solid song. I don’t think there’s a huge difference in terms of the songwriting process. It’s mostly a thematic thing. And we’ve gone for both songs that are hopefully singable in churches as congregational songs but also ones that are good as Christmas items to do in churches, or for people to put on home when they have their family around at Christmas, and for it to be that right kind of atmosphere and mood that people want. SAM: Sleigh bells are definitely the icing on the Christmas song cake. SAM: You mentioned you’re hoping that churches might pick them up – do you write these hoping that they might be sung congregationally? ALANNA: Yeah, some of them. I mean, we’re mindful – we don’t always start out with a song saying ‘this is going to be a congregational song.’ Often we’ll write a song and we’ll say: that sounds very singable, it’s very catchy, it’s got a really clear theme, that would be good for a church to do congregationally. And that will affect the way we package it. So, we might be a bit aware about vocal acrobatics that we do, and not go crazy. Just because that will often scare people away from trying it in their own churches. We’re most mindful of that in our production later on. SAM: The track Love All Lovely, I gather it’s about love. What can you tell us about this song? ALANNA: That is actually based on a poem by Christina Rossetti. Steph, the other singer in our band is an English teacher and loves poetry. So she found this poem, or a hymn, in an old hymn book and just fell in love with it. She likes to use the word love a lot, and everything’s lovely, so it’s very her. But it’s a simple idea of love came down at Christmas time. Jesus is the embodiment of love, of God’s love for us. The fact that God is love. It plays around with a lot of those ideas in a really beautiful, expressive way. It’s a real call to worship God in response to what He’s done and who He is. SAM: The track Transmission is a two-minute interlude, it sounds like the band is having a jam session. Is that what went about in that song? ALANNA: Yes! Pretty much. Again, it’s about the vibe. Making it an album that is fun to listen to as well as something of substance. I actually didn’t have anything to do with that. We just let the guys go crazy in the studio, and that’s what they came up with. It’s very them. I think it breaks up the album a little bit – gives it some space to breathe. Or maybe builds tension for some people. Hopefully it’s a fun one to listen to. SAM: Yeah, speaking of the way the album moves – is there a big idea or message to this album? ALANNA: I guess it kept coming back to humility. The humility of Jesus for us. That’s why we called it Lowly. Also I think the idea of gathering around the manger and gathering around the throne is something that we tried to capture. A real call to come and gather around God and worship him, and be in his presence. SAM: Now you launched this album at a church in Sydney recently, was that a fun night? ALANNA: Yeah, it was really lovely. It was the same church that we recorded Unity in a few years ago, except this time we used the church hall. We wanted to create a space that was really intimate and – Steph likes to use the word magical. We set it up with some really beautiful lights and couches and we only sold a few tickets – there were only about 200 people there which was smaller than our previous gigs. We just wanted it to be a really lovely night of reflecting on what God has done for us. And I guess just capturing the family sense of Christmas. Coming together in a really relaxed setting. It was a really fun night. We did videos of all of the songs, so they’ll be on YouTube really soon. So everyone who didn’t make it to the gig will be able to experience it through them. SAM: Do you have any personal favourite tracks on the record? ALANNA: That is a really hard one. They’re all quite special in their own way. I think Come One And All is the one I feel particular love for. Maybe because I wrote it – which makes me feel quite attached to how it turned out. I’m a real sucker for the big build in a song, and it does that. It has a massive build in it. It starts really gentle and then it builds and then it gets really big and then it drops right back down again. I like when music plays with frailty and then aggression in there as well. It does that for me, musically… Oh they’re all really good – am I allowed to say that? SAM: Yes, you can. It’s your record! SAM: Infant Lowly is a beautiful song, what’s the story behind it? ALANNA: Well, actually this one nearly didn’t make the album funnily enough. There was some hesitation about whether it fit with the rest of the musical vibes we were going for. It’s quite a different sound. It’s a little bit sassy and hits back on the beat a lot. When we were playing the other songs we had chosen for our producer, he said ‘everything sounds the same, we really need to break this up’, and we said ‘well we’ve got this one.’ We played him Infant Lowly and he just loved it and said it was exactly the right thing. And we’re so glad that we put it in. There have been so many people say that it’s their favourite song. My dad says it’s his favourite song, which is nice. And it was really good to put in a song that has lowly in the title of it as a bit of a title track. SAM: You’ve released an incredible video for the track Come One Come All, who put that together? ALANNA: Steph, our other singer, her husband works for a company – Taste Media – they’re a fantastic graphic design company in Sydney. And we worked with them on getting an animation together. Yeah we just based it on the idea of a pop-up book, but from one of those really old Bibles that has drawings in it. It is really something that tries to encapsulate that idea of gathering around the manger. Of inviting people to come and see what God has done. So hopefully that has come through. We just think it’s beautiful. We’ve had a really good response from people liking it and I think our vision is that people will show it in their churches. It’s a quick three minute thing that is quite adaptable to any Christmas service, that churches can show – particularly churches that might not have a full band or access to a lot of music. SAM: Do you know how long it took to make that video? ALANNA: It would have taken weeks, weeks, weeks. Those little cutouts were all hand drawn and hand cut out. It was all done as a series of photographs and given motion afterwards. So a lot of work, yeah. SAM: How long did it take for Lowly to come together? ALANNA: We started planning for it back in January/February. About seven-eight months of actually working on it, from writing songs to actually releasing the album. And there’s weeks of pre-production in there. There’s many days of rehearsing and lots of time in the studio. Then all the mastering and everything that goes on behind the scenes is massive. SAM: Because you did work on it all year long, did you have to get into the Christmas mood early? Did you have to set up a tree or anything like that to get into the zone? ALANNA: Yeah we did do that kind of thing! We brought bonbons wherever we went. Rich – one of our guitarists – went to the Christmas warehouse quite early on in the stage and bought heaps of fairy lights. Everywhere we would rehearse or record, he would set up all these fairy lights to get us in the spirit. It was really fun doing that. SAM: The song My Jesus – what’s the story behind this song? ALANNA: My Jesus has a bit of a country twang, doesn’t it? We call it our country song. Steph wrote this one. I think she wrote all the words actually, on her own. This is really her baby. I think she’s going with the theme of: precious, promise… and another ‘p’ word that has escaped me! Just the idea of Jesus coming again eventually. Going from Jesus being born to us now awaiting his return, and him being the long-awaited Jesus. SAM: Were there any funny moments in the studio while recording Lowly? ALANNA: Well, I had a near brush with death, actually. ALANNA: Yes, I was on a bit of a health kick. I was catering for the whole week we were in the studio. I bought all of the vegetables – masses and masses of vegetables that I was going to feed everyone with. And I was cutting up celery and didn’t realise that I’d put my bunch of celery right on top of the toaster cable. And I plunged down with this knife and cut straight through the toaster cable that was plugged in. And it sent this massive shock through the knife, blew the fuse, and the knife was completely ruined – but I was not harmed at all! SAM: Wow! That’s incredible! That would have been a terrible end to the Lowly project! SAM: And how was the toaster, not so good? SAM: And nearly died in the process… Well I’m glad that you’re alright Alanna. I’m glad this album came to be. What have you got planned for 2014? ALANNA: Ooh. That is a good question. I actually don’t know yet. At the moment we are concentrating on Christmas tours so we’re just doing a whole bunch of carol services around Sydney. Which, makes sense! We’ve got a little trip planned to Melbourne in January so we’ll go down and visit our friends there. Apart from that, we don’t have heaps of plans yet and I’m sure there will be a really long, funny meeting where we talk about all our hopes and desires for next year. We will keep you posted. SAM: Well watch this space! The last track on the album is one of my favourites, The Holly and the Ivy. It’s got sleigh bells in it – it’s very Christmas. What can you tell us about this song? ALANNA: Well I really wanted us to do this carol. It’s one I grew up on. Mum said that she was really obsessed with this particular Christmas album when I was in the womb, and she would play it all the time. And I have loved it ever since – I don’t really know if there’s a connection there, whether I heard it in utero or something – but The Holly and the Ivy was one of the tracks on it. I love it. When we were looking into it, it’s an interesting kind of theme of comparing the growth of the holly – the berry of the holly – to Jesus’ blood. And making connections between what we see in nature and what we know of Jesus. We added a chorus in there and added a bridge in there to give it a little more clarity on what it was saying. Hopefully we did it justice. Again, it’s one of those with an epic build which I love – a real fun one to do live. SAM: Why did you choose this to close the album? ALANNA: I think the way it ended was the way we wanted the album to end. So we started with an acapella thing and end with this acapella thing as well. It gives it a nice close. It ends with a grand acapella moment. We hope it works as a final chapter. SAM: Alanna, thanks for the chat. It’s been really good to get my ears around this Lowly record, and all the best with touring and what’s to come next year. 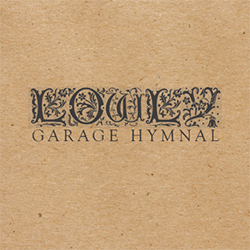 Lowly by Garage Hymnal is available now on the Garage Hymnal website and iTunes. Posted in MusicTagged Album, Carols, Christmas, Christmas Album, Christmas music, Garage Hymnal, Hymns, Interview, Jesus, LowlyBookmark the permalink.